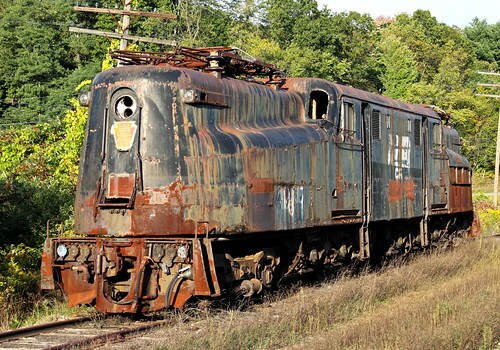 This half-million pound hulk is a GG1, once the most handsome electric locomotive on the rails. Some 139 more GG1s were built and they ran for almost 50 years, right up until the early 1980s, when I was getting interested in trains. I got to see the last of these art deco machines rolling through Newark Penn Station a few times, which was nice. I've photographed this particular GG1 at least a half-dozen times and had no intention of ever doing so again. But we were only five miles away one evening, and my son, who's had his first DSLR for six weeks, started talking about the golden hour and the ideal time to take pictures ... our truck was soon zipping east on a detour to Cooperstown Junction. There's one other GG1 parked here, and 350,000 mosquitoes.